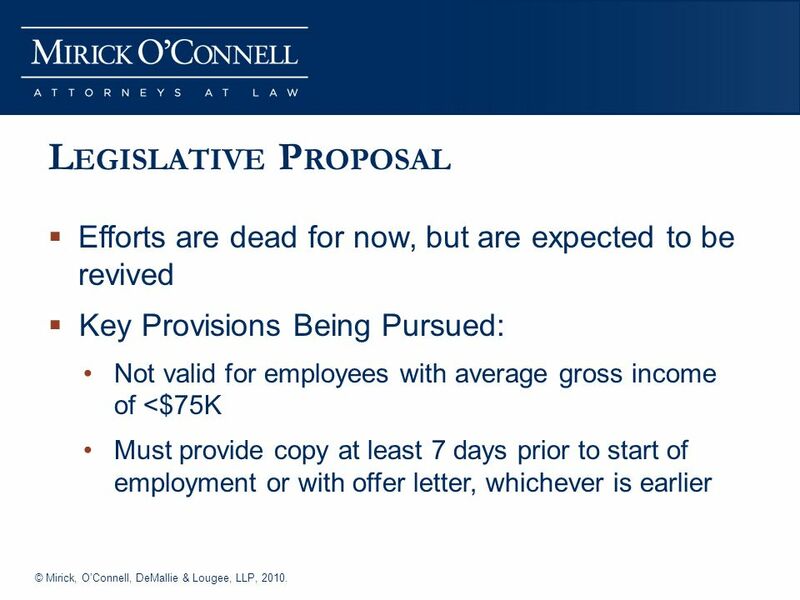 7 © Mirick, OConnell, DeMallie & Lougee, LLP, 2010. N ON -D ISCLOSURE A GREEMENTS Key Questions Who should be required to sign? All employees or a subset? What should be covered? 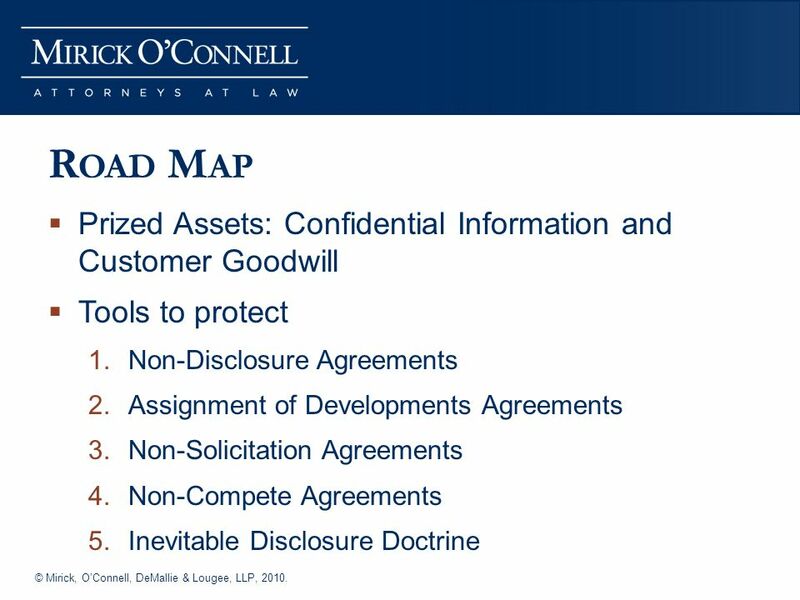 How long should the Non-Disclosure obligation last? 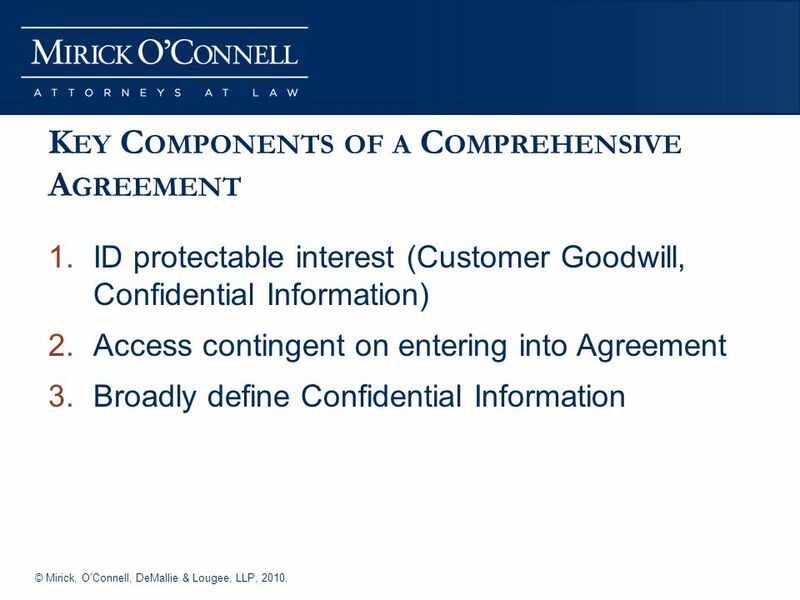 What if your employees have not signed a Non- Disclosure Agreement? Are you still protected? 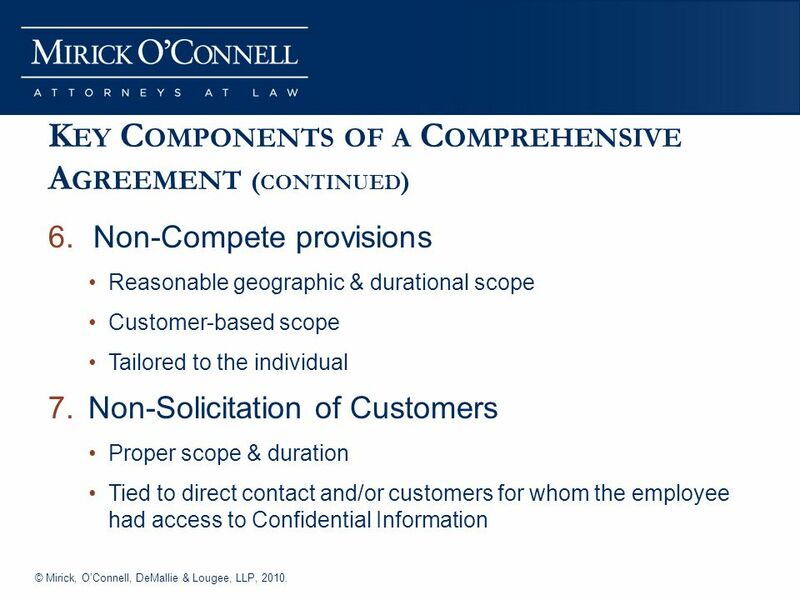 9 © Mirick, OConnell, DeMallie & Lougee, LLP, 2010. 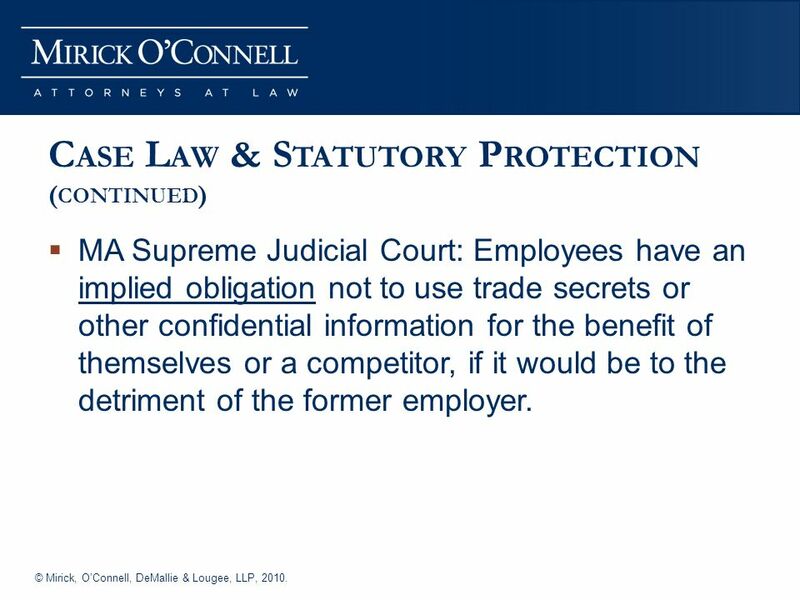 C ASE L AW & S TATUTORY P ROTECTION ( CONTINUED ) MA Supreme Judicial Court: Employees have an implied obligation not to use trade secrets or other confidential information for the benefit of themselves or a competitor, if it would be to the detriment of the former employer. 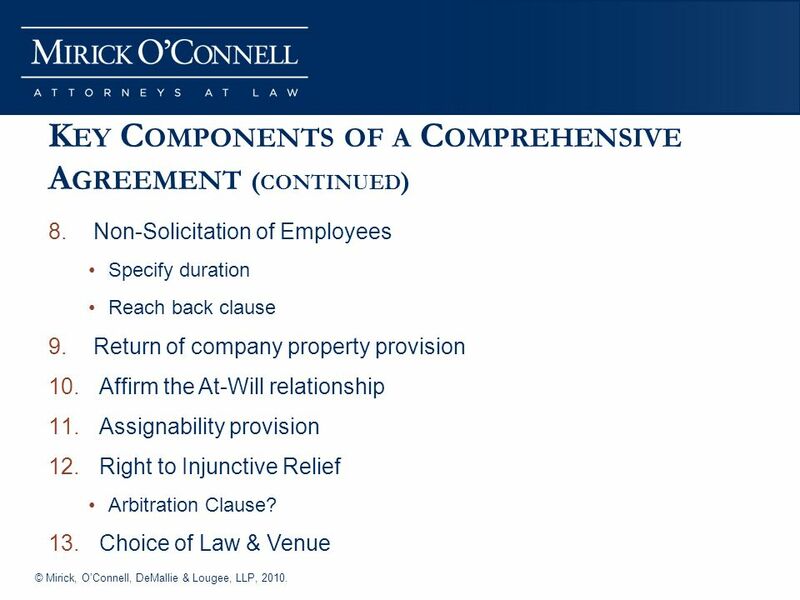 11 © Mirick, OConnell, DeMallie & Lougee, LLP, 2010. 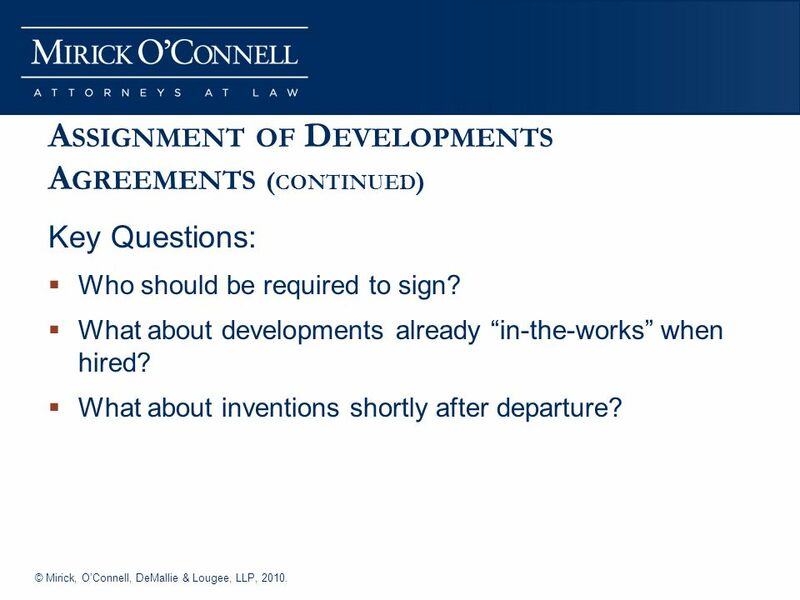 A SSIGNMENT OF D EVELOPMENTS A GREEMENTS ( CONTINUED ) Key Questions: Who should be required to sign? What about developments already in-the-works when hired? What about inventions shortly after departure? 12 © Mirick, OConnell, DeMallie & Lougee, LLP, 2010. N ON -S OLICITATION P ROVISIONS Customer Non-Solicit Duration of restrictions? 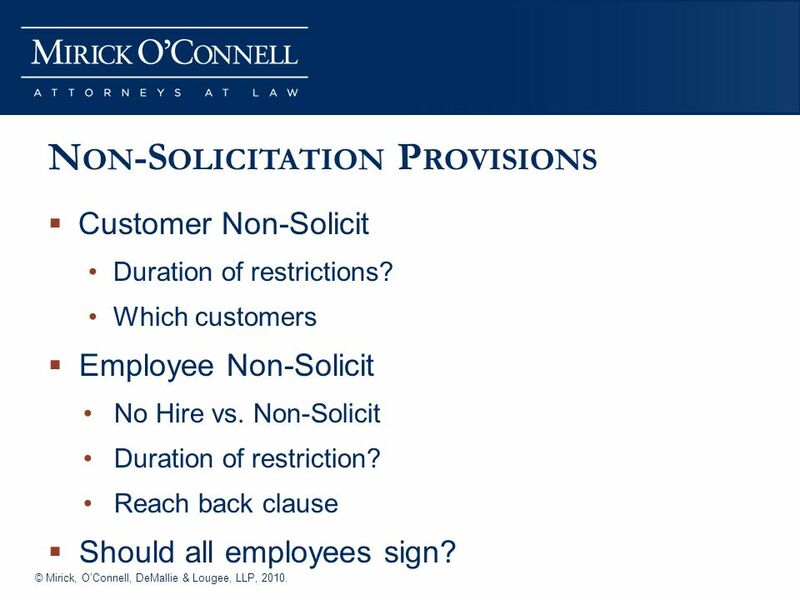 Which customers Employee Non-Solicit No Hire vs. Non-Solicit Duration of restriction? 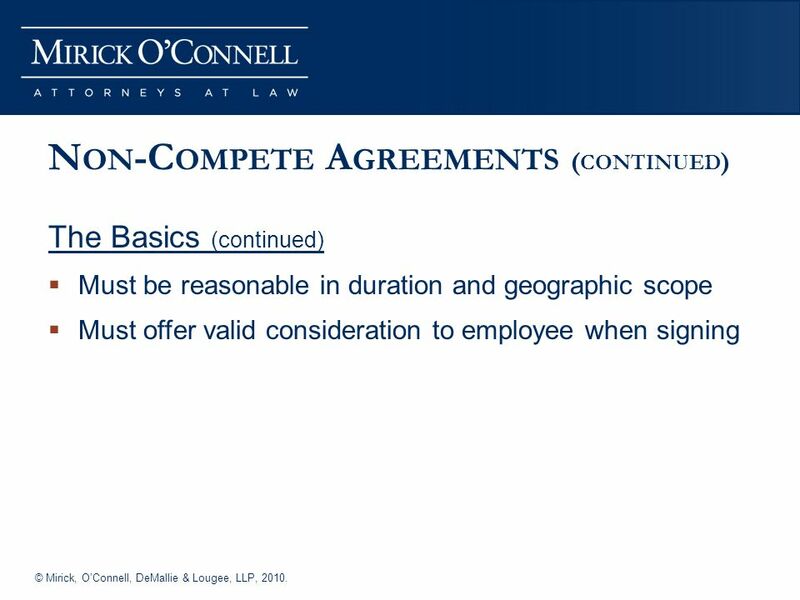 Reach back clause Should all employees sign? 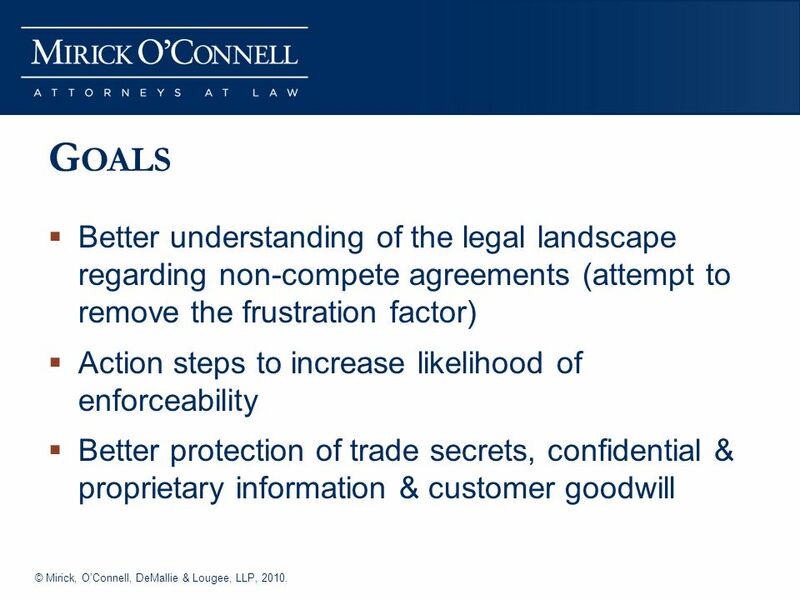 15 © Mirick, OConnell, DeMallie & Lougee, LLP, 2010. 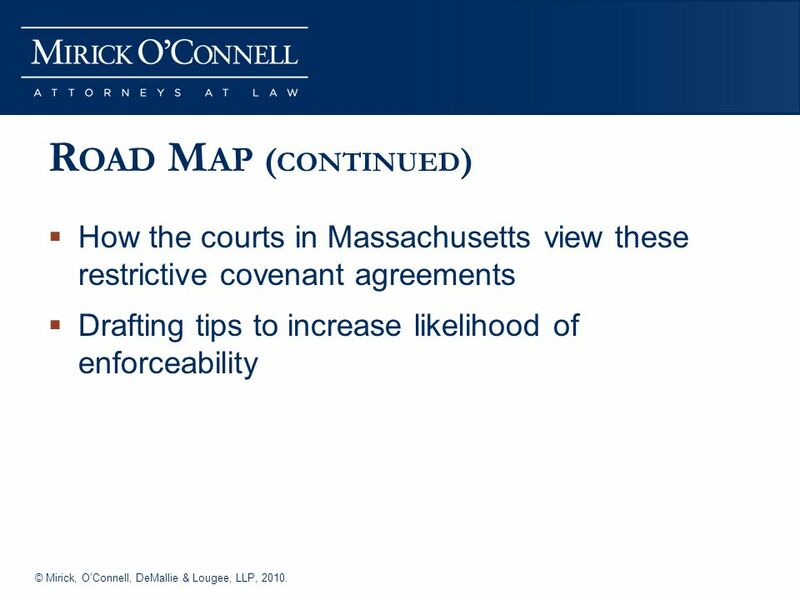 N ON -C OMPETE A GREEMENTS IN M ASSACHUSETTS What constitutes valid consideration? Can at-will employees be required to sign? What if you didnt require signing at time of hire, but want to do so now? What happens if an employee is promoted? What if an employee receives a pay raise? What if an employee has a material change in job duties? 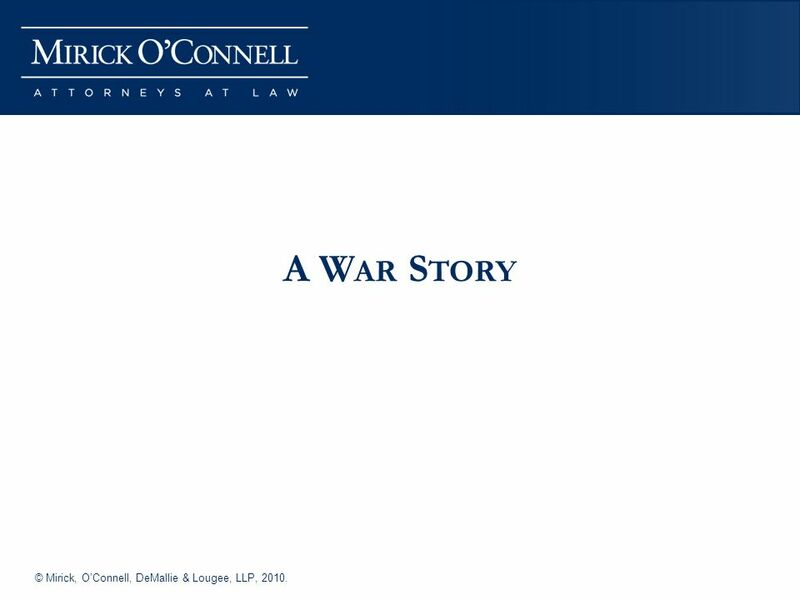 16 © Mirick, OConnell, DeMallie & Lougee, LLP, 2010. 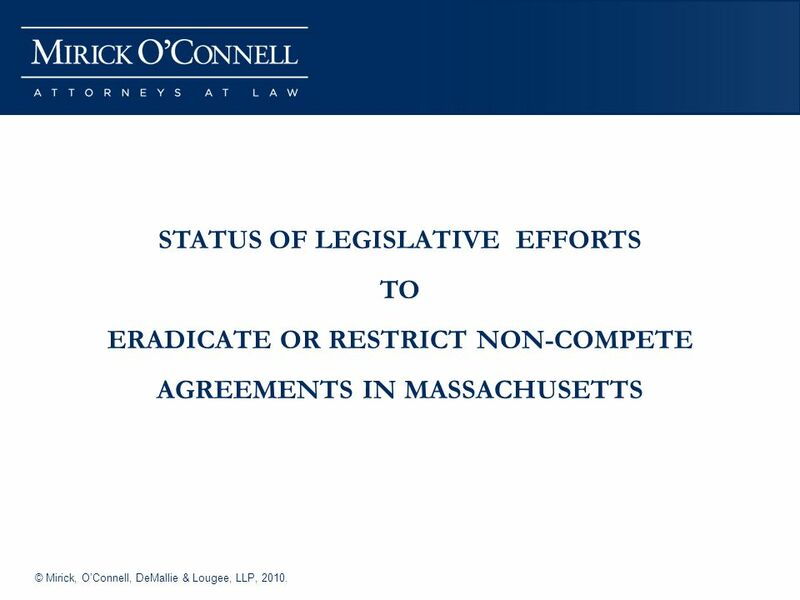 N ON -C OMPETE A GREEMENTS IN M ASSACHUSETTS ( CONTINUED ) For how long after employment ends should a former employee be restricted from competing? Can you restrict him/her worldwide? 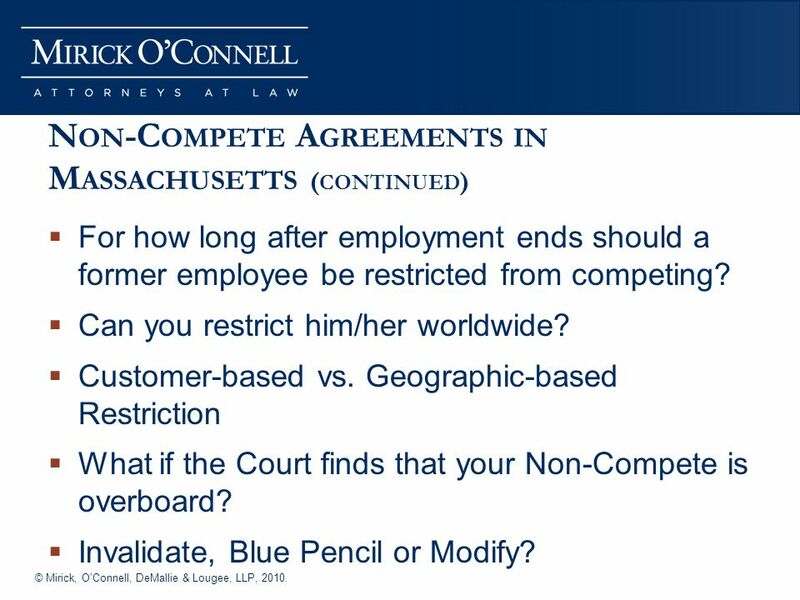 Customer-based vs. Geographic-based Restriction What if the Court finds that your Non-Compete is overboard? Invalidate, Blue Pencil or Modify? 17 © Mirick, OConnell, DeMallie & Lougee, LLP, 2010. 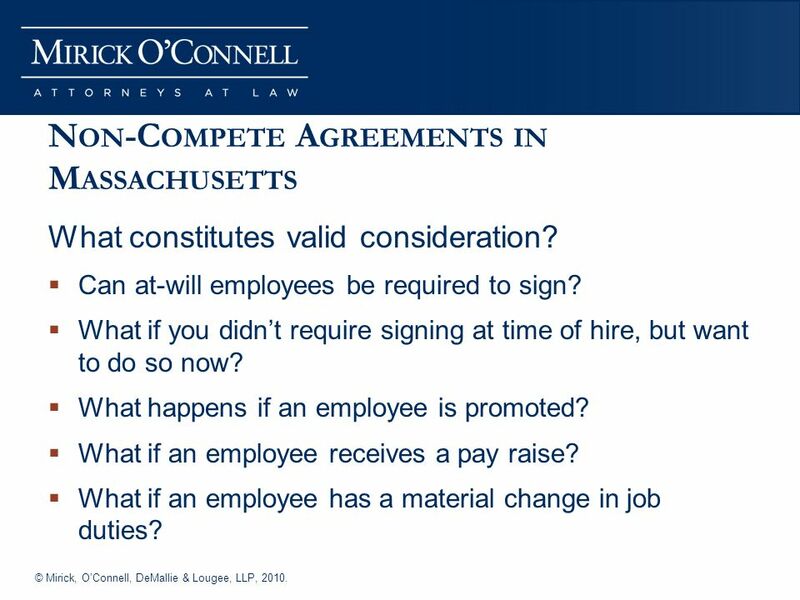 N ON -C OMPETE A GREEMENTS IN M ASSACHUSETTS ( CONTINUED ) Should all employees be required to sign? What if an employee refuses to sign? Play hardball? Negotiate a less restrictive agreement? Pay to keep the employee on the beach? 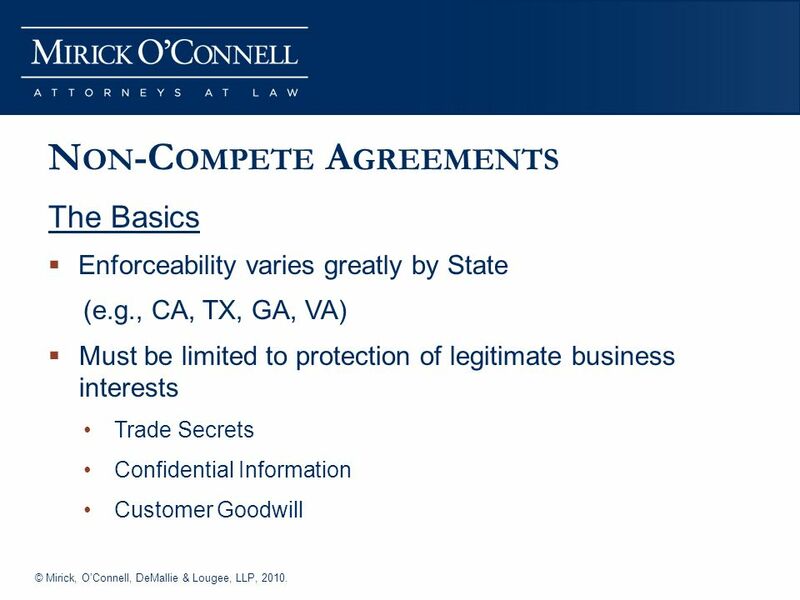 18 © Mirick, OConnell, DeMallie & Lougee, LLP, 2010. 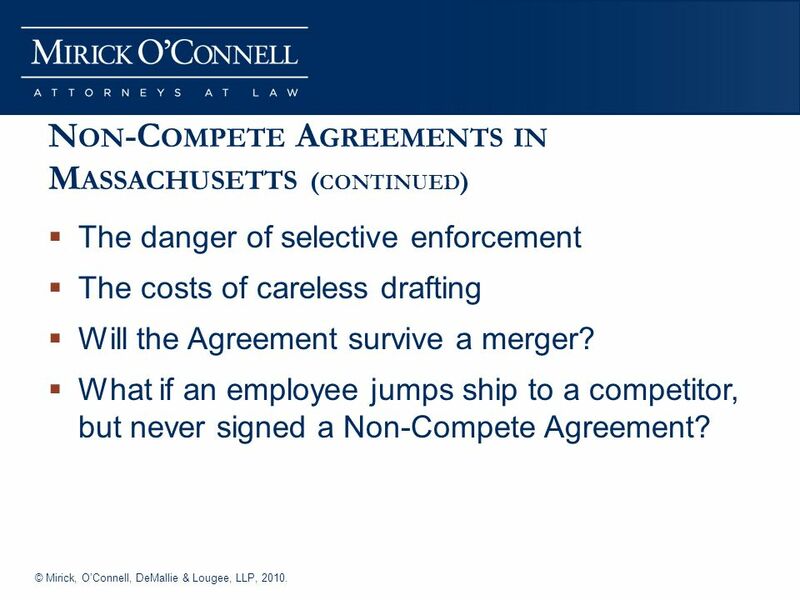 N ON -C OMPETE A GREEMENTS IN M ASSACHUSETTS ( CONTINUED ) The danger of selective enforcement The costs of careless drafting Will the Agreement survive a merger? 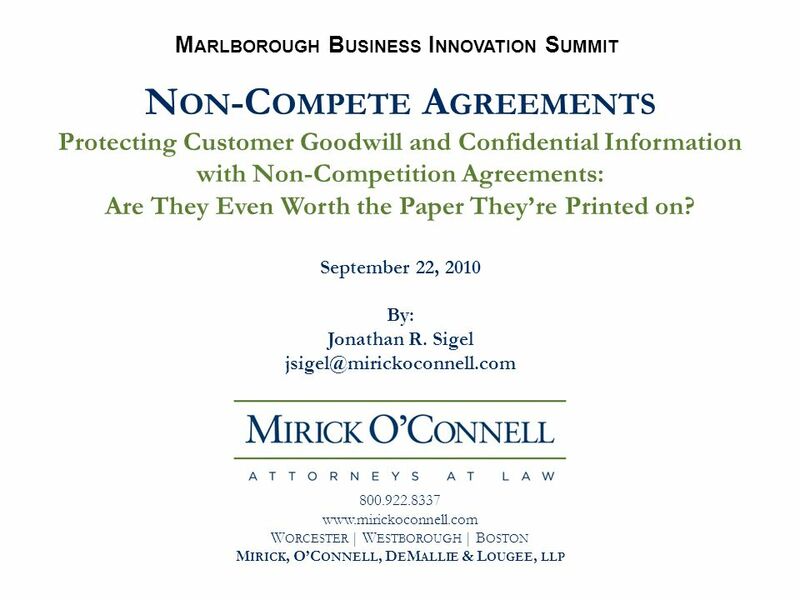 What if an employee jumps ship to a competitor, but never signed a Non-Compete Agreement? 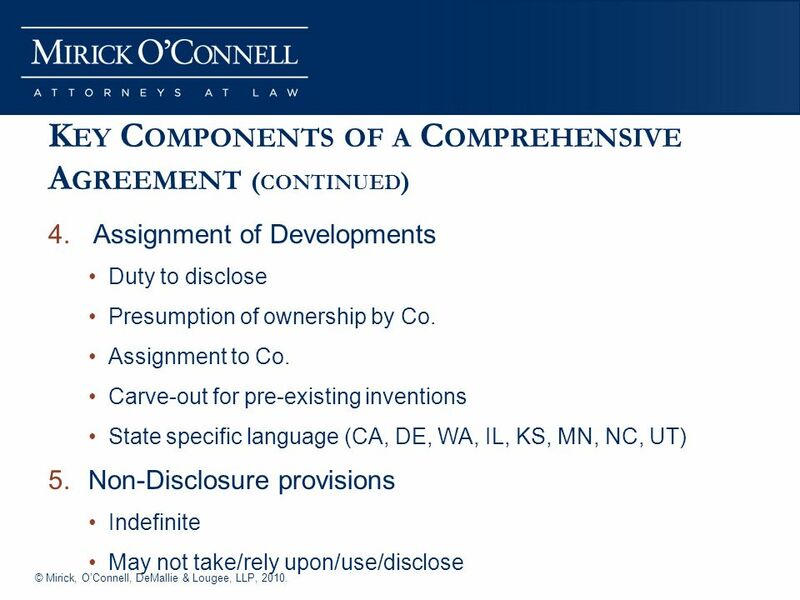 19 © Mirick, OConnell, DeMallie & Lougee, LLP, 2010. 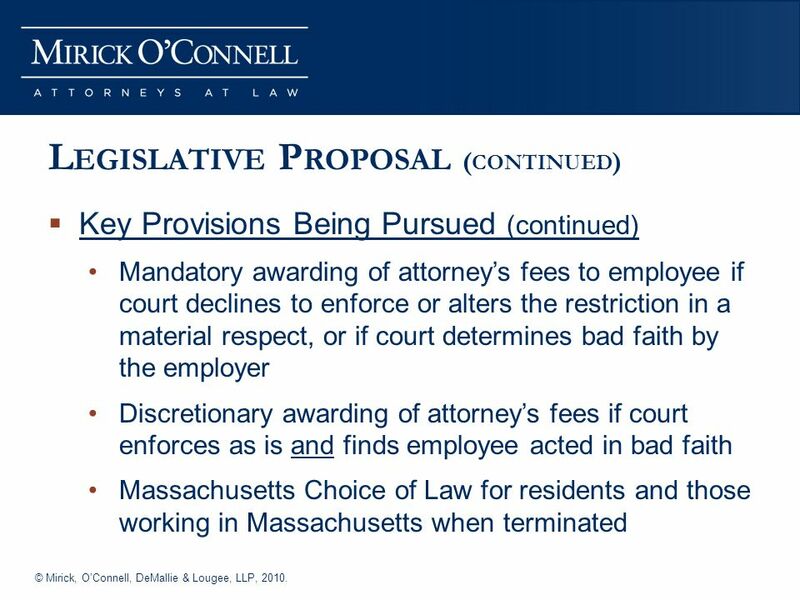 I NEVITABLE D ISCLOSURE D OCTRINE Established, but not firmly established, in Massachusetts Need near-identical job duties and responsibilities Typically need to show that employee cannot be trusted. He/she will inevitably rely upon, use or disclose the employers confidential information. 28 © Mirick, OConnell, DeMallie & Lougee, LLP, 2010. Q UESTIONS ? 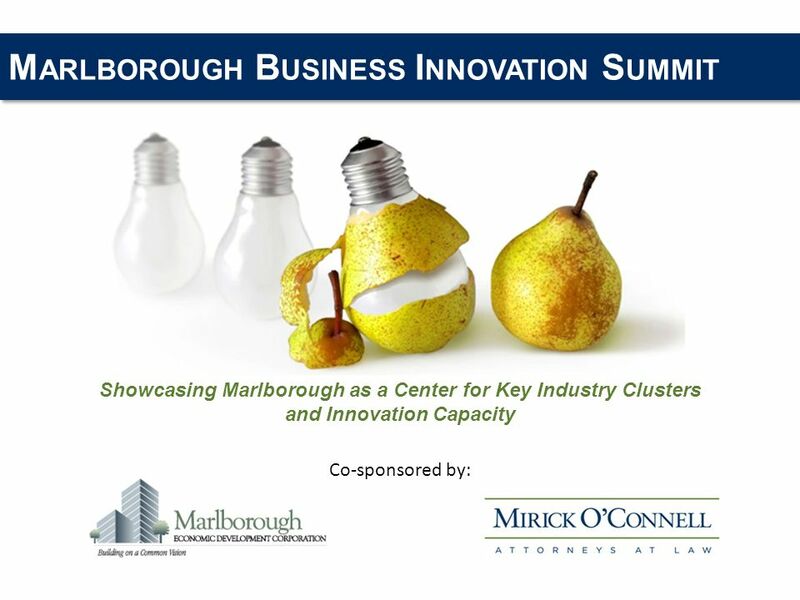 Download ppt "M ARLBOROUGH B USINESS I NNOVATION S UMMIT Showcasing Marlborough as a Center for Key Industry Clusters and Innovation Capacity Co-sponsored by:"
© Mirick, OConnell, DeMallie & Lougee, LLP, M ARLBOROUGH B USINESS I NNOVATION S UMMIT Showcasing Marlborough as a Center for Key Industry Clusters. Covenants Not to Compete To Sue or Not to Sue, that is the Question. Business Legal Checklist for Purchasing A Digital Media Company Using Videogame Developers & Publishers As Case Studies. TRADE SECRETS. 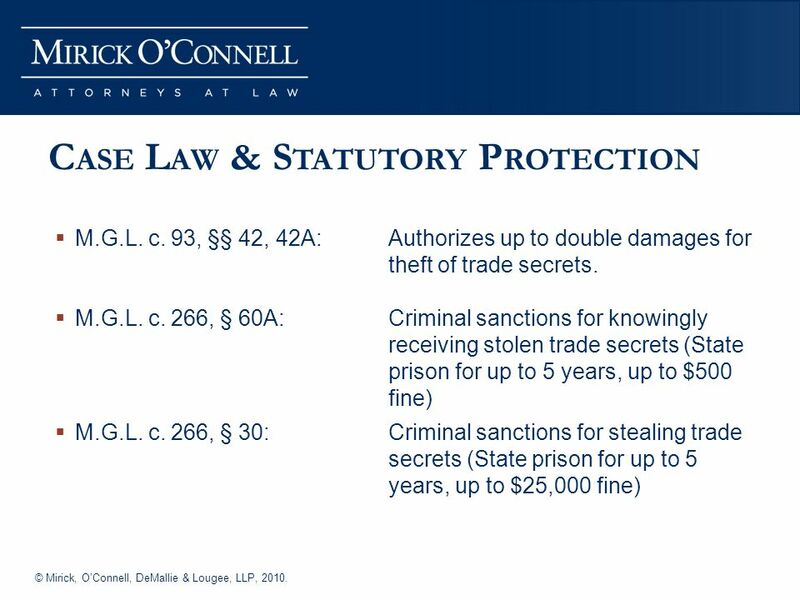 Outline of Presentation What are trade secrets Keeping them secret Trade secrets or patents Legal protection for trade secrets and remedies. 1 Forms of International Business Trade International licensing of technology and intellectual property (trademarks, patents and copyrights) Foreign direct. CHAPTER 3 Implied terms of law. Implied terms of law Some terms may be implied into all contracts of employment. This means that some obligations must. 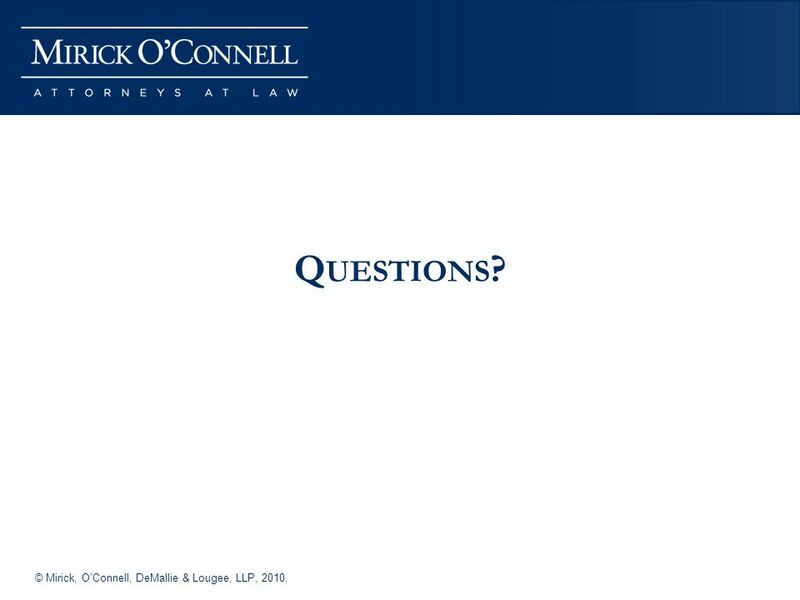 Mackrell International South Carolina Employment and Labor Law—A Brief Overview May 29, 2012 David Dubberly. DELVACCA Presents: Non-disclosure Agreements Don’t Get Stung March 11, 2010 Doug Raymond, Drinker Biddle & Reath LLP David J. Anderson, Kulicke & Soffa. Presented By: D. Kevin Davis, Partner. 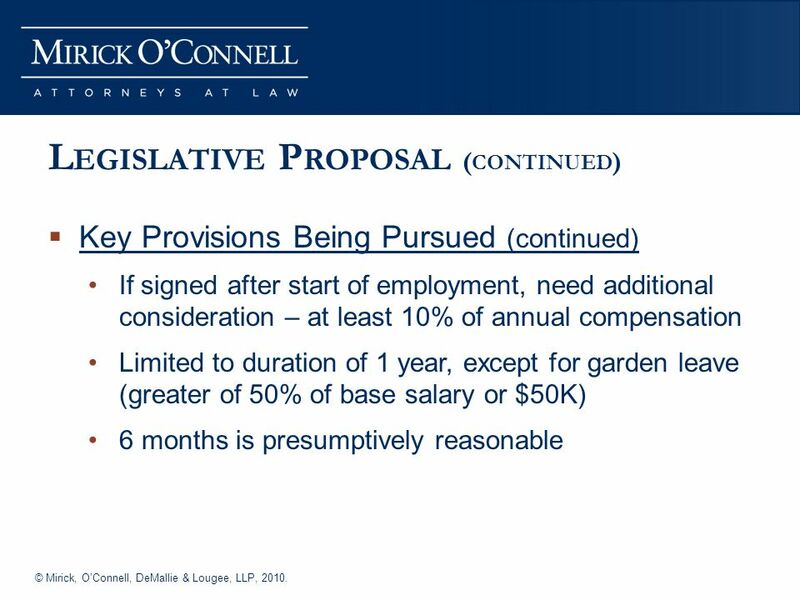 Why are employment agreements useful for an employer? - incorporating personnel policies into the employment relationship.  Is it time to redefine these classic property concepts? Elena Marty-Nelson Professor of Law NSU Law Center. What is in your Employee Files? Disclaimer: “I have no relevant financial relationships with the manufacturers of any commercial products. 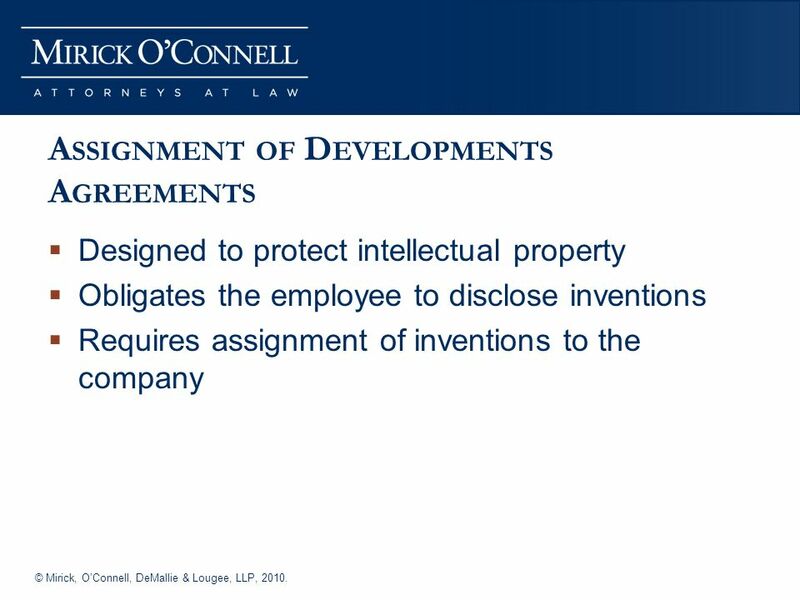 Intellectual Property Considerations in Joint Development Agreements Presented by H. Eric Fisher, Ph.D. Eckert Seamans Cherin & Mellott, LLC Continuing. Your Top Talent Walks Out the Door: Now What? How to Stop Your Competitors from Raiding Your Workforce and Engaging in Unfair Competition in the U.S. and. 1 Employment Law Update 2005 Justin Patten & William Josling 29 th November 2005.